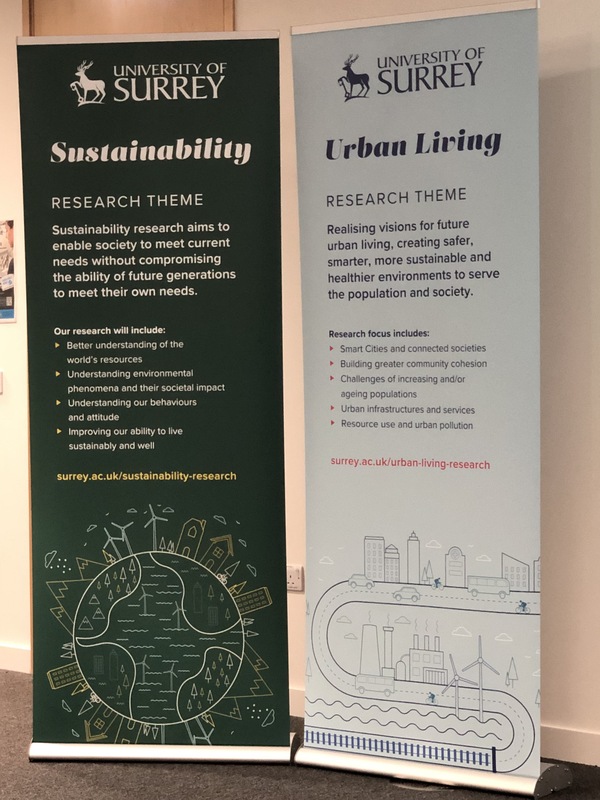 It is a privilege to be invited to open the Research Themes Celebration for our two active themes Sustainability, led by Richard Murphy, and Urban Living, led by Matt Leach. On Monday night, I attended the Guildford Innovation Awards, and saw some great University of Surrey entrepreneurs win prizes for taking research out of the lab and into the real world. The “Technology Integrated Health Management for Dementia” team took out the Outstanding Innovation of the Year Prize – this project, in collaboration with the NHS Surrey and Borders Partnership, is led by health care academic Emma Ream at Surrey, Helen Rostill at the NHS, and Surrey engineer Payam Barnaghi. Sensors are used to monitor the health status of dementia patients in their homes and machine learning techniques are used to extract early signs of health changes that require interventions. What a great interdisciplinary project! A perfect example of collaboration! At Surrey, we are, indeed, good at collaboration: 76% of our publications have a non-Surrey author, and our top ten collaborators are: University College London; Imperial College London; University of Oxford; CNRS in France; University of Cambridge; King’s College London; CSIC in Spain; the National Physical Laboratory; and the Royal Surrey County Hospital NHS Foundation Trust. Research Themes are an important part of our collaboration story. Earlier this year, I wrote a blog on what a Research Theme should seek to achieve. Let me summarise it here. Create an open, transparent and inclusive environment in which researchers can come together to create synergies that would otherwise be less likely to occur. It should provide a nurturing environment in which the good values of the organisation are transmitted and individuals are mentored and supported. Eventually deliver (say within 5 years) at least one major grant of scale – Centre for Doctoral Training, Doctoral Training Partnership and/or major multi-million £ programme grant. You can see from this description that a Research Theme needs an altruistic, community-minded leader who facilitates and supports – and I congratulate Richard and Matt in having amply demonstrated these attributes. Surrey is lucky to have you. Then, I also wrote on what should a Research Theme not do. It should not be the single vehicle into which all of Surrey’s research is shoe-horned or the only (or even primary) way in which the University’s research is to be presented. The new and refreshed Research and Innovation Strategy currently being written, and due to be launched next year, will reinforce this notion. Thus, a Research Theme will not seek to impose itself on existing large-scale activities, nor represent them necessarily. Rather, we seek to promote a theme framework in which people and groups voluntarily wish to join a theme because of what it brings – a win-win. So, tonight we are here to celebrate the “win-win” of being part of the Urban Living and Sustainability Research Themes. Where are we going with other Research Themes? Well, we have “on the books”: Lifelong Health and Wellbeing; Innovation for Health; Digital Innovation; and Space and Aerospace. We are thinking about these options right now. Key to these, as you have gathered, is leadership. Meantime, we are also looking to define and activate a new theme in Technology and Society and one in the healthy ageing space. What else are we busy with right now? Our new early-career fellowships programme, just advertised – seeking to appoint 3 new fellows a year for 3 years. Both of these are aimed at supporting our Strategic Hires campaign to grow the scale and quality of the research endeavour. And who here has the Surrey Research Park app? Download it tonight! We are also seeking to reinvigorate our Campus-Research Park engagement – we interact with 53% of the 140 companies on the park, generating more than £3m in direct value of interactions over the last few years, but we could do so much more. – the NERC SCENARIO 2 Doctoral Training Partnership with Reading University with leads from Civil and Environmental Engineering, Maths and the Centre for Environment and Sustainability. And Richard Murphy may say more about emerging opportunities to leverage and support other Surrey activities including in Estates & Facilities, the new Learning Hotel, and in aspects of the teaching curriculum. And on the Urban Living Theme front, there is the Clean Air Engineering (CArE) CDT bid for a community of scholars working on solutions to polluted indoor and outdoor environments in cities, collaborating with….two of our top 10 collaborators Imperial and NPL. A number of special interest groups have developed and are emerging: on transport (we rank in the range 51-75 in the world in Transportation Science and Technology, ARWU), on clean energy and healthy ageing, as core elements of the University’s approach to the Industrial Strategy, with early thinking having been done and nascent cross-disciplinary groups already formed. Surrey has just secured a significant stake in the new £8m Industrial Strategy-funded Energy Revolution Research Consortium on scaling up local energy systems – led by Strathclyde, a strategic partner with Surrey and NPL. And the GlobalHOM initiative will see a prototype smart home built on campus which will serve as a research testbed. Planning approval has been granted and construction will begin in the New Year; and GlobalHOM have collaborated with all three faculties in winning more than £1m from Innovate UK’s Industrial Strategy Transforming Construction programme. So, I am sure tonight’s programme will only serve to reinforce what great initiatives our Research Themes represent – and I look forward to learning more.